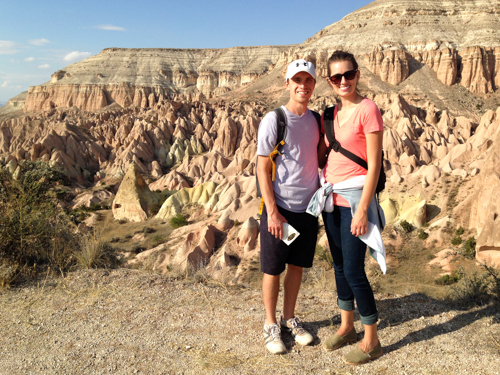 After an incredible hot air balloon ride, we got a chance to see the scenery up close. 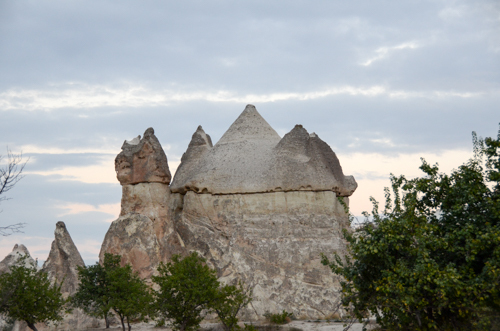 The entire valley is dotted with what they call fairy chimneys which are uniquely shaped mountains that often have small churches carved into them. There are many ways to enjoy the area. Below is how we saw the sights. 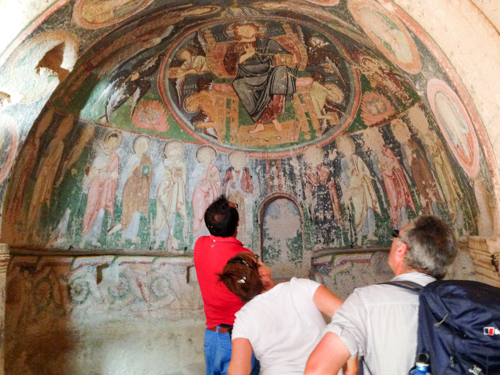 The Open Air Museum is a highly concentrated group of churches, some with really beautiful murals. There are plaques describing what you are viewing which is handy. But it is a bit more crowded so go early. I highly recommend paying extra to visit the Dark Church. The murals are really lovely. I believe you can pay either at the front of the Church or at the ticket office at the Open Air Museum. 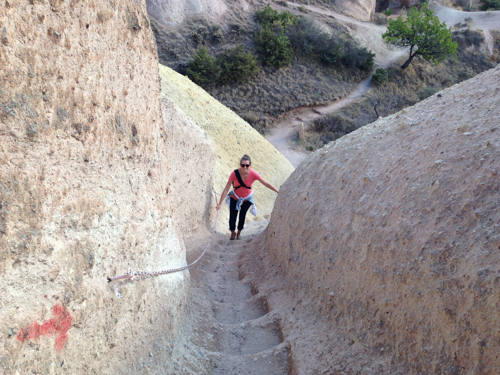 Hiking through the Rose Valley is a little bit of an adventure. Sure there are signs, but every single one said "Rose Valley 1 km." And then 15 minutes later it would have another saying the exact same thing. 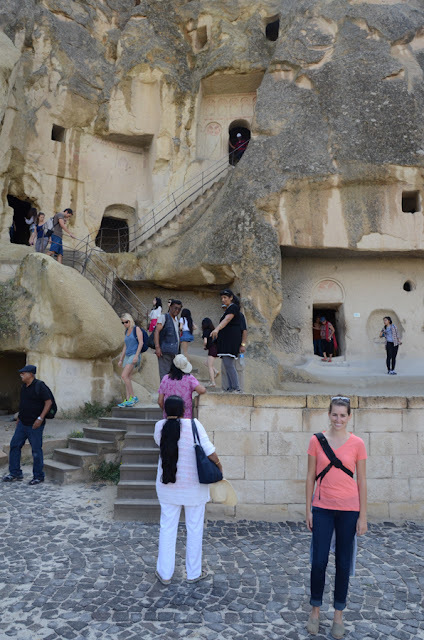 We felt like we were lost the entire time and teamed up with other travelers who felt equally lost. 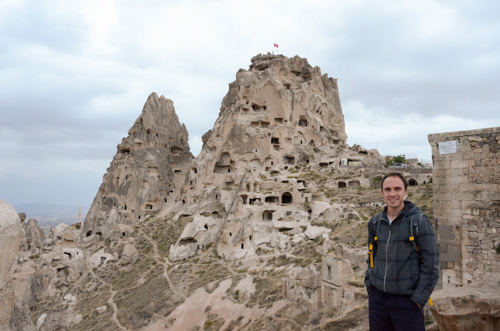 Somehow we made it from one end to the other, stumbling along makeshift churches carved into the mountains. 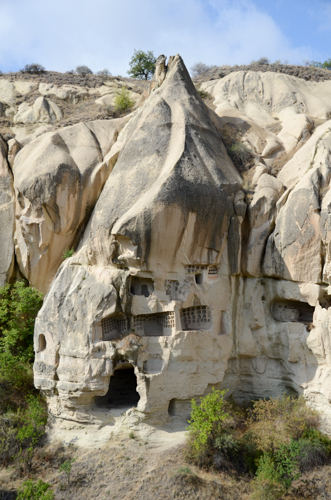 Most were pretty bare but others (like the picture above) still had beautiful frescoes. 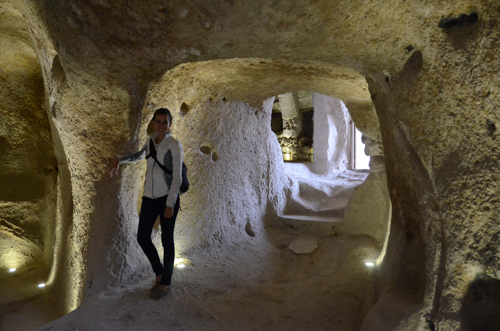 One of the coolest things we did was explore the underground city of Kaymakli. 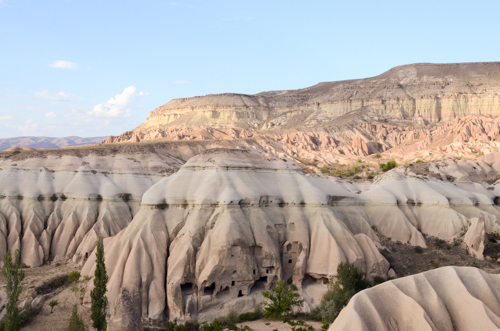 It's a bus ride away from Göreme but well worth the trip. 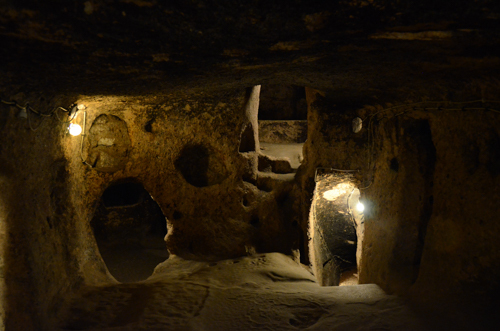 Four levels are open to tourists and it is really cool to see how they would have figured things out to stay underground for up to six months at a time. 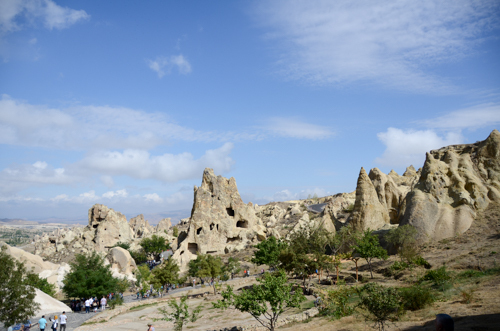 My two big tips for visiting Kaymakli is to visit during lunch time while the big tour groups are eating, and to hire a guide. It costs extra but we teamed up with two other English-speaking couples so we could split the cost. Without the guide it would have been, "ooh look at this rock... and look! A hole!" 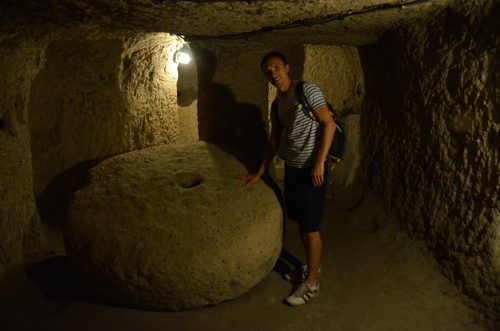 But the guide pointed out that the hole was for ventilation and the rock was to keep out enemies, etc. You get the idea. Get a guide. 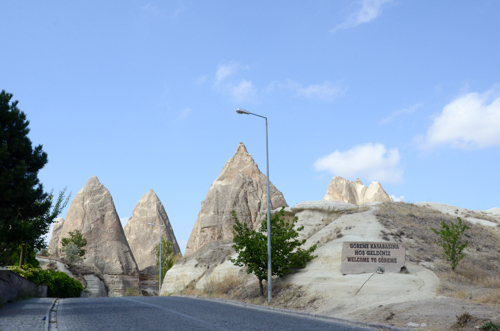 Visiting Uçhisar Castle is a bit out of the way and inconvenient if you are using public transportation (which we were), but the views of the valley were beautiful and it was a neat place.